This post is brought to you by Earlier Today Tara, as This Evening Tara is busy with family stuff, having fun, and laughing, and explaining that she IS in costume–as a Domestic Engineer. Ha. That makes me laugh. My Mama put that as her job on forms she had to fill out back when I was little. At least I remember the conversations about it; she didn’t want to put housewife because no way was she married to her house. Anyway…..Happy Today. Really today’s thoughts are from the littles. Yesterday our Princess had been outside on the porch playing with the cats. She is especially close to Sugar, the grown cat we nursed from three weeks old. When she came back in, she flopped on the couch and sat for a minute. “Sure, baby. Go ahead.” I tried not to point out she already had. 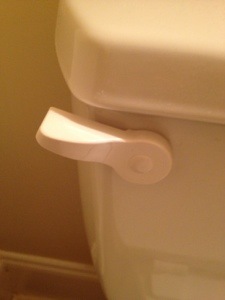 Oh the things that little handle could solve…..if only it could. Wow. Yes ma’am it sure would. Turns out she’d been out there talking to Sugar about how we found him and she got upset for him all over again. She is my child. She works through a lot of stuff out there talking to that cat. Just like I used to with Midnight sitting on my lap on the back steps at Blackberry Flats. There’s nothing like having an animal that will listen. And pat the tears coming down your cheeks. And there you go. Even though Princess told him he had the answer wrong, I told him I thought that was a pretty good one. Don’t you think? That right there. That’s my girl. She can climb trees, collect frogs, hit a ball with skill, and help save herself and her friends from the master of evil himself, BUT when it all comes down to it, that girl LOVES to accessorize. It tickles me that she used the costume idea to try and get another purse. Tickled me, but no, we didn’t get her one. It’s after Labor Day for goodness’ sake. And I’m grateful for the excitement and joy that cookie cutters and pumpkins and new pencils and dressup clothes and bouncy puppies can bring. As Mama would say, Happy Everyday, y’all. 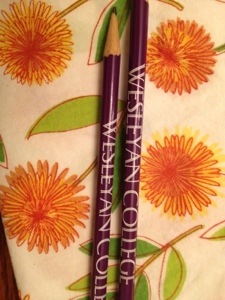 Our new pencils. Our Princess is so excited because she is already ready to go there–Golden Heart of 2027! 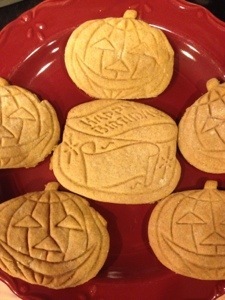 We made these today for our Fall Family Hootenanny. They are too fun, aren’t they? I made this batch for me. These are tradition, and that matters to me. Mama made these every fall. 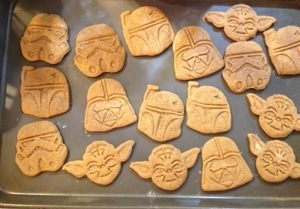 I used her cookie cutters to make these today. Also going to the Fall Family Hootenanny. 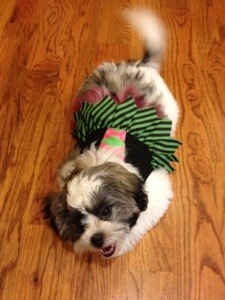 Our fluffy ball of happiness, the Good Witch Sophie. Love that her tail is blurred because she was so excited the whole time! ← After the Pink Ribbons Have Faded…..